Life is a journey. Enjoy the trip. $60.119 million on 3985 screens. 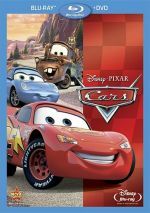 A continuation of Pixar’s hot streak, 2006’s Cars introduces us to Lightning McQueen (voiced by Owen Wilson), a rising star on the racing circuit. On the way to a big competition in California, he falls out of his tractor-trailer and ends up stuck in Radiator Springs, a burg bypassed by the rest of the world. Lightning accidentally grinds up the town’s main street, so as punishment, Judge Doc Hudson (Paul Newman) requires him to repave the road. Lightning greatly resents these impediments, but he doesn’t have much choice. Stuck in the sleepy burg, he gets to know the residents and starts to grow attached to them. These include retired racer Doc, one-time hotshot lawyer Sally Carrera (Bonnie Hunt), and tow truck Mater (Larry the Cable Guy). The film follows Lightning’s interactions with them as well as his attempts to get to the big race. Sure, Cars gives us a story that borrows liberally from 1991’s Doc Hollywood. Sure, it occasionally seems more preoccupied with product placement and shiny visuals than story and personality. Sure, a lot of the characters suffer from fairly lackluster development. All of those things occur to the viewer only after the screen goes dark, and even then, they don’t provoke any angst. As Cars runs, it offers so much entertainment and razzle-dazzle that these minor flaws fall by the wayside. This is a bright and delightful piece of work. Cars was the first flick in seven years to feature Pixar head honcho John Lasseter as director. He helmed the studio’s first three big screen offerings: 1995’s Toy Story, 1998’s A Bug’s Life and 1999’s Toy Story 2. Others took on the next three efforts before Lasseter finally returned for the studio’s seventh movie. I regard Lasseter’s first three films as arguably Pixar’s best. 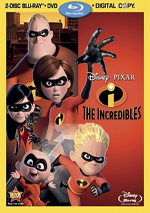 Only 2004’s The Incredibles deserves consideration as well, as I’m not all that wild about 2001’s Monsters Inc. or 2003’s Finding Nemo. No, but it’s still a ton of fun. When compared to the other Pixar flicks, Cars probably most closely resembles A Bug’s Life. That one also borrowed heavily from the story of another film – Kurosawa’s Seven Samurai - but it was so entertaining that I didn’t care. The same holds true for Cars. One could easily nit-pick and find flaws in this flick. In addition to the plot it borrows from Doc Hollywood, no one will claim that any of the characters stand out as particularly original. They’re pretty stock personalities without elements that make them especially creative. Nonetheless, they come across as likable and winning. Pixar sure scores some points with the presence of Paul Newman as crusty old Doc Hudson. Newman didn’t act much during the years prior to his death, but it clearly wasn’t because he lost his touch. He brings the right touch of gruffness measured with warmth and authority to the part. He scores the needed laughs but manages to offer a nicely three-dimensional turn. All the other actors do fine as well, and we even find a pleasant surprise. I scoffed when I saw that “lowest-common-denominator comedian” Larry the Cable Guy would appear in the film, but he offers a pretty funny performance as Mater. Larry channels the late Jim Varney – a Pixar fave – but manages to come across as more than just an imitator. Mater becomes a likable and fun character due to Larry’s solid work. In the end, I don’t want to spend too much time on a discussion of Cars just because it’s not a film that holds up to great scrutiny. Regard this as a movie for which the whole is much greater than the sum of its parts. One could easily pick it apart, but why bother when you can have so much fun instead? Cars appears in an aspect ratio of approximately 2.39:1 on this Blu-ray Disc. No concerns affected this terrific presentation. Sharpness seemed strong. If any problems occurred, I didn’t see them, as I thought the movie looked consistently crisp and well-defined. No issues with jagged edges or shimmering occurred, and I saw no signs of edge enhancement. Source flaws also were absent, as the film showed no marks of any sort. Cars went with a vivid palette that the disc replicated well. The tones always came across as dynamic and lively, as the disc showed excellent color accuracy. Blacks were dark and dense, while shadows seemed clear and appropriately visible. This was an outstanding transfer that lacked any problems. While not quite as terrific as the visuals, the LPCM Uncompressed 5.1 soundtrack of Cars also worked well. With only one slight exception, the soundfield was quite effective. Lots of localized speech occurred, most of which seemed well-placed. A few lines from the left lacked great delineation, but those were exceptions, as most of the dialogue was appropriately located. Effects always seemed accurately placed, and the meshed together neatly. This was an active mix that used all five speakers to good advantage. This was particularly evident in the racing scenes, but other sequences added good kick and action across the various channels. The movie made nice use of the environment to create a vivid setting. Audio quality was solid. Speech seemed natural and concise, with no edginess or other problems. Music sounded lively and dynamic, while effects were consistently accurate and vivid. Bass response was low and firm. Despite the minor distractions from the occasionally mushy localization of dialogue, I thought the audio of Cars succeeded. How did the picture and sound of this Blu-ray compare to the film’s DVD version? The Blu-ray’s lossless audio appeared smoother and more natural, while visuals appeared tighter, more vivid and more dynamic. Though I thought the DVD presented the movie well, it couldn’t keep up with the excellent Blu-ray. The DVD skimped on extras, but the Blu-ray does a lot to compensate. I’ll note Blu-ray exclusives with special blue print. For the biggest attraction, we get Cine-Explore. 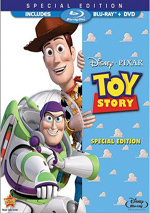 This presents two separate audio commentaries, and the first comes from director John Lasseter. He provides a running, screen-specific look at the film’s origins, inspirations and development, story areas, characters and their design, influences, cast and performances, research, music and other aspects of the film. I suppose it’s possible Lasseter will someday deliver a bad commentary, but Cars doesn’t mark that occasion. Instead, the director offers a truly delightful, all-encompassing look at the movie. He gets into personal stories that add relate to the flick as well as the usual nuts and bolts. From start to finish, Lasseter delves into the film in an engaging, informative manner that makes this a winning chat. For the second commentary, we hear from story artists Dan Scanlon, Steve Purcell, directing animators Bobby Podesta and Jim Murphy, supervising animators Scott Clark and Doug Sweetland, production designers Bob Pauley and Bob Cone, shading art director Tia Kratter, director of photography Jean-Claude Kalache, supervising technical director Eben Ostby, character supervisor Tim Milliron, and set supervisor Sophie Vincelette. Some of them sit together and chat, but with so many participants, obviously they can’t all be in the same place at the same time or chaos would ensue. They go over animation and technical areas, research and influences, story and character issues, design topics, deleted and altered sequences, and other production elements. Though not quite as delightful as Lasseter’s piece, this big team of commentators gives us a good look at Cars. I feared that it’d be a dry recitation of nerdy details, but it broadens into something much more engaging than that. The commentary delivers a good mix of the creative and the technical; I especially like info about story issues. Only a few pieces repeat from Lasseter’s track, so this one stands very well on its own. “Cine-Explore” adds art and photos as the film progresses. These reflect the content of the commentaries. We see concept art for characters and other early designs as well as photos of cast and crew. Branching video featurettes and deleted scenes also appear; I’ll discuss them in a separate area. Disney discs love games, so we locate one here: Carfinder. As the movie plays, it requires you to identify various vehicles. Maybe someone else will find fun here, but I think it seems tedious and unenjoyable. We find two separate shorts, and Mater and the Ghostlight fills seven minutes, nine seconds. It stars the movie’s lovable tow truck as he plays practical jokes on the other residents of Radiator Springs and then gets his comeuppance. It’s not a classic, but it’s an entertaining little piece. The second short ran prior to theatrical screenings of Cars. One Man Band lasts four minutes, 33 seconds, and shows a heated competition between two street musicians as they vie for the donation of a little girl. This one proves mighty amusing. We also get a four-minute and 20-second Epilogue. This lets us see the animated elements from the end credits without the text. I like this feature since it allows us to get a clearer view of the material. Boundin’ Cars offers a 46-second clip. It pairs the song from the 2004 short Boundin’ with shots of bouncy Mater. I don’t know what purpose it serves, as it seems pretty pointless. The Inspiration for Cars runs 16 minutes, two seconds as it features movie clips, behind the scenes materials, and interviews. We hear from director John Lasseter, author/speaker Michael Wallis, co-director Joe Ranft, barber Angel Valades Delgadillo, Lasseter’s father Paul, racecar driver Jerry Nadeau, Infineon Raceway president/general manager Steve Page, broadcaster Darrell Waltrip, self-appointed Mayor of Redneck Hill “The Real Mater”, Lowe’s Motor Speedway president/GM Humpy Wheeler, racing legend Tim Flock’s son Don, Speedway Motorsports Inc.’s John Zudell and Randy Wray, and racing legend Richard Petty. “Inspiration” looks at research behind the movie. We see how the Pixar folks learned about Route 66 and NASCAR. We also learn a lot about the personal influences that affected Lasseter. While “Inspiration” doesn’t substitute for a full “Making Of” documentary, it offers a nice taste of the factors that were behind the film. Four Deleted Scenes occupy a total of 10 minutes, 33 seconds. These include “Top Down Truck Stop” (3:51), “Lost” (1:44), “Community Service” (3:15) and “Motorama Girls” (1:43). “Truck Stop” offers an alternate way for Mack and Lightning to separate, while “Lost” finds him spooked in a car graveyard. Dream sequence “Service” transforms Lightning into a steamroller and “Girls” shows us how Flo and Ramone became a couple. All of these appear via storyreels that combine filmed art and audio. The four are quite interesting and fun to see. The Blu-ray adds one additional Deleted Scene. “Traffic School” goes for three minutes, 27 seconds and shows McQueen’s efforts to become “street legal”. It’s another enjoyable clip; I can’t say it should’ve made the final cut, but it’s a nice clip. We also find some Radiator Springs Featurettes. These are the clips that appear during “Cine-Explore”. We discover “Radiator Springs” (5:25), “Character Design” (6:06), “Animation and Acting” (5:16), “Real World Racing: Getting Geeky With the Details” (5:30), “Hudson Hornet” (2:44), “Graphics” (3:34) and “Darrell Waltrip Museum Tour” (7:13). Across these, we hear from Lasseter, Kalache, Cone, Pauley, Kratter, Clark, Sweetland, Murphy, Podesta, Zudell, Page, Wheeler, Waltrip, character modeler/animator Andrew H. Schmidt, character lead Colin Thompson, art coordinator Jay Ward, race sequence editor Steve Schaffer, Fox Sports director Artie Kempner, Hudson Hornet enthusiast Dave Bonbright, character and environment designer Jay Shuster, graphic designer Ellen Moon Lee, and graphic designer Craig Foster. The programs cover story/character areas, set/location and car design, visual/color choices, animation and art, vehicle-related authenticity, and a look at the Darrell Waltrip Museum. Given all the info found elsewhere, it becomes inevitable that a little bit of redundancy will occur. Nonetheless, the featurettes offer a mix of good details. They cover a nice variety of subjects in a satisfying manner. A few ads open the disc. We find promos for Enchanted, WALL-E, Meet the Robinsons, and Ratatouille. These also appear in the Sneak Peeks area along with ads for the Cars video game and Disney’s Blu-ray releases. 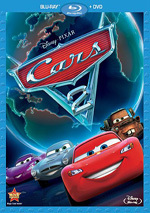 Pixar continued their incredible winning streak with the delightful Cars. Thoroughly entertaining and enjoyable, this one turns out to be a consistent joy. The Blu-ray provides excellent picture and audio as well as a terrific set of bonus materials. I continue to enjoy Cars and this becomes a great Blu-ray for it.